I personally started using Altearah Bio products 15 years ago, when they first began. I was so pleased by their effectiveness that I use them during consultations and workshops, and I decided to become one of their distributors. 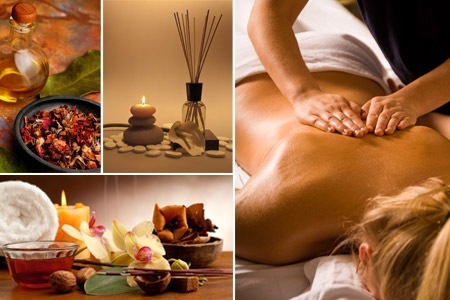 Aromatherapy consists of using essential oils for therapeutic ends. Through massage, using face and body oils, serums or scrubs. Essential oils are extracted from botanically certified aromatic plants, i.e. plants identified by their Latin name (narrow-leaf eucalyptus essential oil, for example, is obtained from the Eucalyptus radiata plant). The essential oil is extracted from the plants with great care, so as not to affect the characteristics of their chemical compounds or diminish their potential. There are a number of extraction procedures, but the most common is distillation. 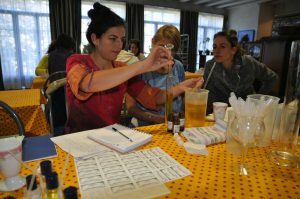 Most essential oils are obtained by steam distillation, without the use of chemical descaling agents and at low pressure. The process involves passing steam through a tank filled with aromatic plants. The steam extracts the essence of the plant and forms a uniform gaseous mixture with it. As it is expelled from the tank under controlled pressure, the steam mixed with essential oil passes through a cooling coil and condenses. The liquid then flows into a Florentine flask or “essencier” where, because it is less dense than water (density <1), the essential oil floats on the surface of the aqueous distillate (hydrolate or floral water) and is drawn off though the overflow pipe. Chromotherapy is a method of treatment based on the use of colours. 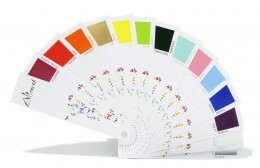 Each colour has its own universal or personal symbolism, always directly related to the senses. Colour stimulates the mind, affects the body, reveals and releases our emotions. 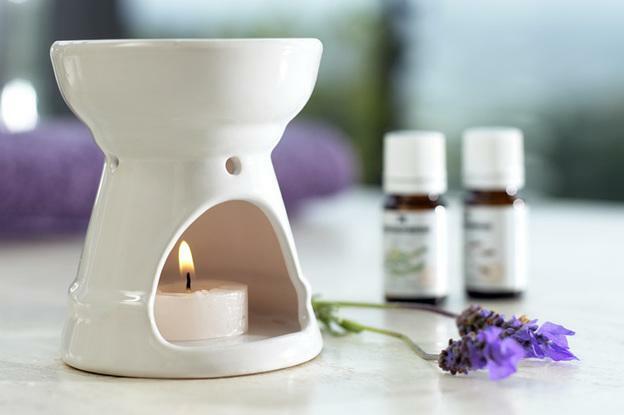 The olfactotherapy is a treatment method that uses the smells and vibration of essential oils. Spray 2–3 times in the Palm of your hands, rub your palms to evaporate the alcohol portion, place them near the face and breathe deeply. Spray widely all around you and let you wrap the benefits of olfaction. RED - Encourages action. Colour of vitality and dynamism. ORANGE - Awakens senses. Colour of creativity, relaxation and serenity. GOLD - Be yourself. Find your self confidence, relax. YELLOW - Joy. Be spontaneous. GREEN - Freshness and liberty. EMERALD - Breath of air, a burst of freedom. TURQUOISE - Brings serenity and tranquility. Anti-stress, relaxes body and mind. BLUE - Colour of peace, calm, tranquility. Gives peace of body and mind. INDIGO - Relax, find again your pattern of sleep. VIOLET - Helps in meditation. WHITE - Colour of purity. Cleanses deep-down and regenerates. SILVER - Repairs, restructure after a choice.